Dublin Chamber, along with the Simon Community are urging businesses to support people who are homeless this Christmas, through the Simon House of Cards Appeal. This vital fundraising initiative asks companies to make a donation in lieu sending cards, gifts and other Christmas gestures to their clients and business relationships. The call for support comes as the latest Rough Sleeper and Emergency figures for Dublin were recently released. The official DRHE figures show 184 people bedding down across the city. This is a 4% increase since last spring and an 18% increase from last winter. In addition to this, the latest figures for the number of adults and children in Emergency Accommodation across Ireland show a growth to 8,492 in October, up from 8,374 in September. 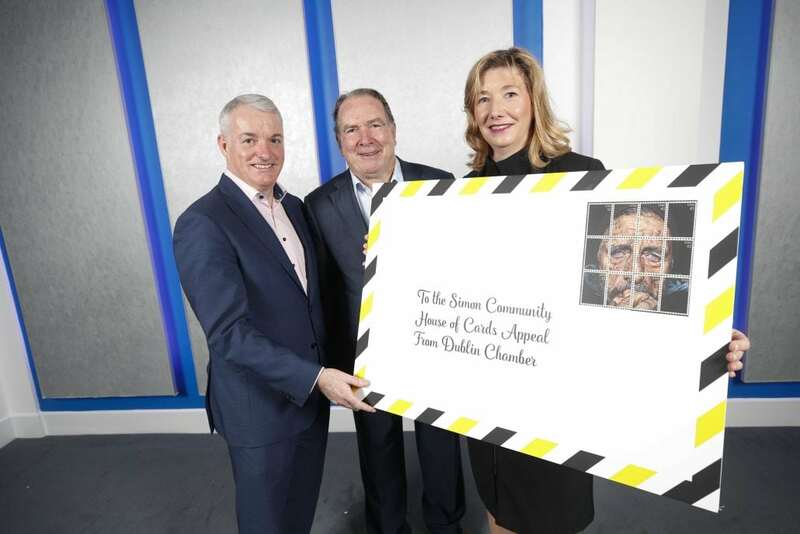 Urging fellow business leaders to pledge to the House of Cards Appeal, Mary Rose Burke, CEO of Dublin Chamber, emphasised the importance of the campaign to those who are being affected by the housing and homeless crisis. Mary Rose Burke continued to say that Dublin Chamber have committed to creating a sustainable solution to the housing crisis by choosing Dublin Simon Community as their charity partner for two years. Instead of sending cards and gifts over the Christmas period, the Simon House of Cards campaign asks companies to donate to their life saving homeless services. By doing so, the campaign hopes to raise over €600,000 to deliver vital housing and life saving supports that will respond to the unprecedented demand for help. In recognition of your valued contribution, your company name or logo will be seen by more than 317,000 Irish Times readers as well as being seen in the spectacular “Simon House of Light” projection show on Powerscourt Townhouse Centre between the 7th and 9th December. You will also have access to a range of personalised E-Cards to send to colleagues and friends. Businesses can get involved with Simon House of Cards by logging onto www.simonhouseofcards.ie.